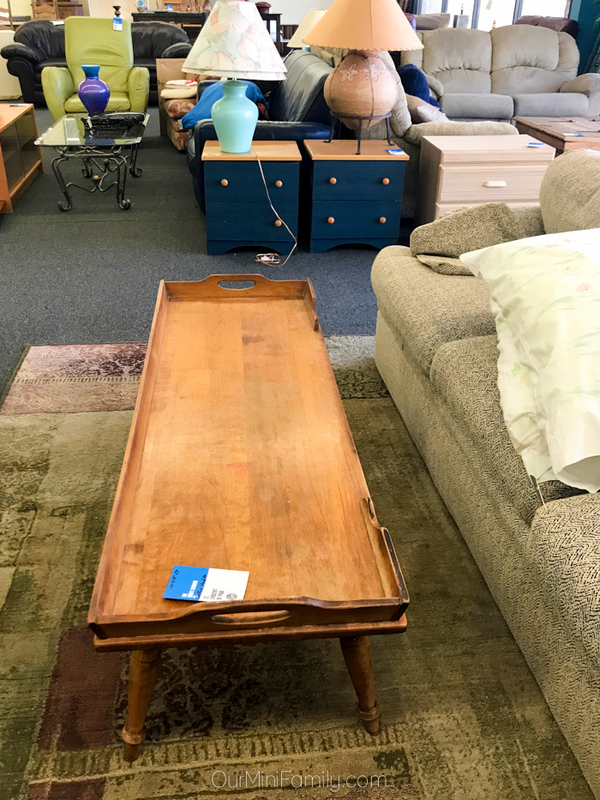 Thrifting can be fun, but it can also help you furnish your home with unique finds! 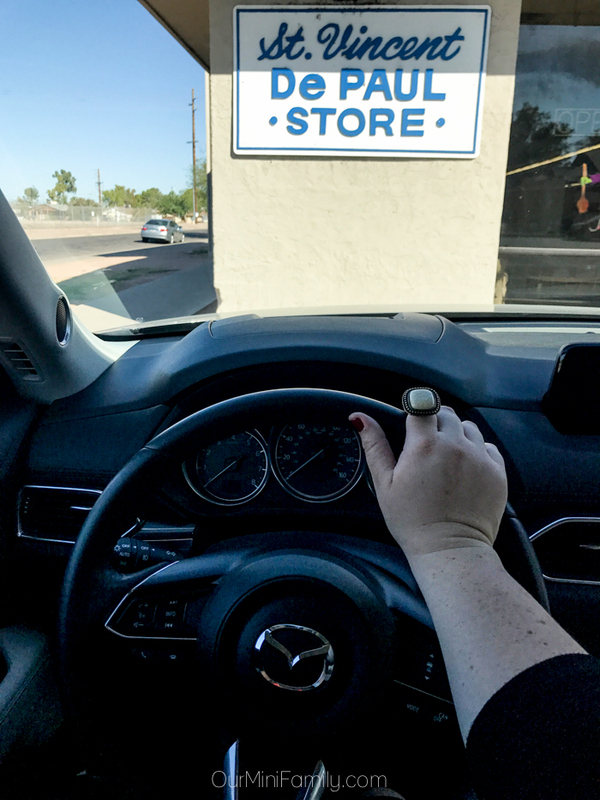 Learn more about some of my must-haves for successful thrifting--special thanks to the team over at Mazda for hooking us up with a great car to help us with our thrifting adventures this week! Thrift shopping has become more and more mainstream over the years. Especially after Macklemore's "Thrift Shop" came out on the radio and took off on the charts. But long before that catchy song graced our radios, we have been "popping tags" out of necessity and not just because it's the cool thing to do. When Adam and I first moved to Arizona together back at the turn of the decade, we had nothing except a couple of suitcases to our name. No housewares, nowhere to sleep, nothing to sit on...we came with a couple of outfits and important keepsakes packed into suitcase from our childhood and merely the bare essentials. That was all. So when it came time for our big cross-country move, we had very little money to spend and had a lot to accomplish. That's when I looked to thrift store shopping to furniture our empty apartment, and help transform this new place into the start of our new home. At the beginning, I had no idea what to buy except that I wanted it to be clean-looking and cheap. 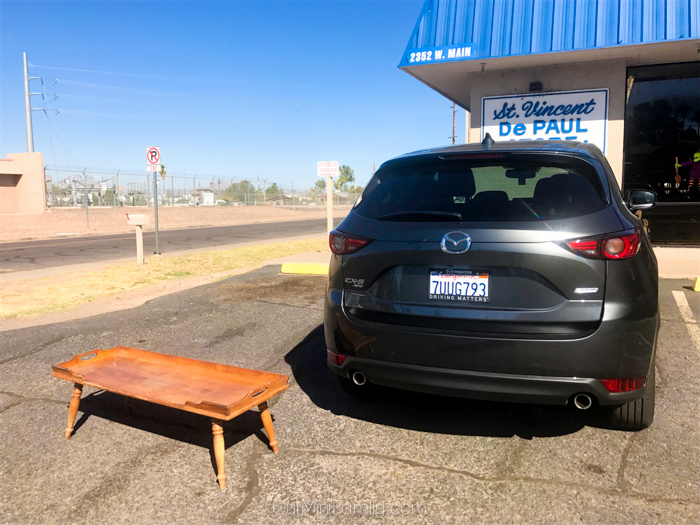 But over the years, I have learned many tips and tricks when it comes to hunting for great bargains and oftentimes getting my hands on valuable antiques that I can bring into my home to add more character and also provide a purpose (like this new-to-me coffee table I found this week while test driving the 2017 Mazda CX-5!) 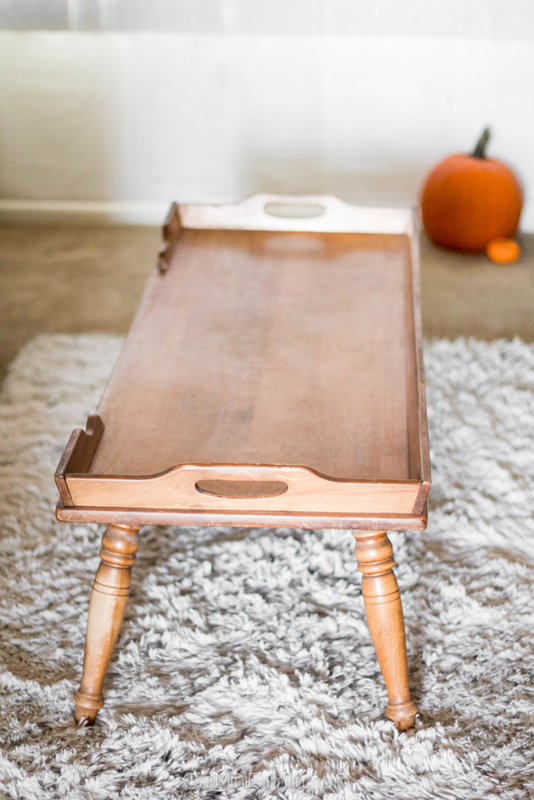 Today, I'm sharing a few pictures of my most recent find, this coffee table, as well as more must-haves in order to successfully thrift shop like a pro! Earlier this year, I shared some of my thrift shopping must-haves on the blog (click here to see them). 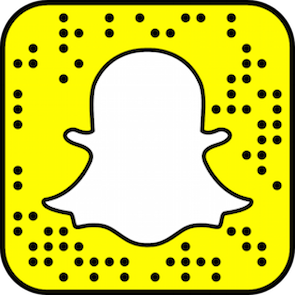 Since then, I have had requests to share more of my thrifting tips and techniques as I have begun sharing even more of my curated items on Snapchat and Instagram. 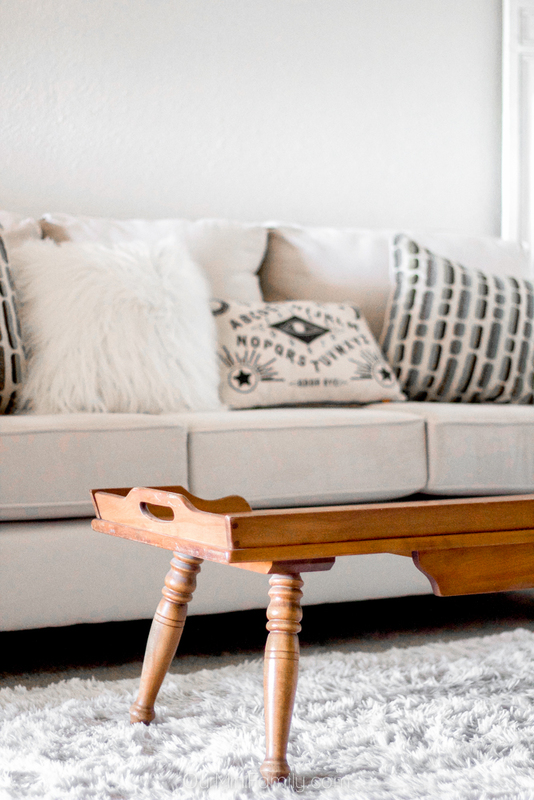 After having people DM me and ask me how I am able to get my hands on so many awesome items while thrift shopping, I decided it was time to share even more of what I consider to be my thrift shop must-haves! Ever get to the store and fall in love with something, only to bring it home and see that it completely clashes with everything else in the room? Fear not! That's where paint chips and fabric swatches come in! What I like to do is take pictures of the items already in my home, and I keep them in an album on my phone. For instance, I bought this really cute printed canvas that has a lot of warm golds, browns, and neutral colors in it but I have had difficulty finding the 'right gold' color to match it. What I've found helpful is pulling up the picture of my canvas on my phone while I am shopping, and it helps me remember to stay away from cooler neutrals and gold accented items. Some thrift stores will let you negotiate with them, and in these instances, cash is your friend. It can be uncomfortable asking someone to lower a price, but it is much easier to incentivize them with actual cash in your hand. When I went to Mexico in the spring on my press trip, I had the chance to sharpen my haggling skills at el malecon. After this trip, I became more confident in my ability to successfully haggle with merchants and I took this confidence with me to the local stores here in the valley! Last week, I bought a set of antique chairs for our dining room table that was going for $15. I approached the sales floor associate who was able to offer deals, and I asked him how much the chairs were (I already knew how much they cost, as I saw the sticker price on the back of them). He walked over to the chairs with me, looked on the back of them, and flatly said "$15." I didn't react, but I did remain silent while looking down at them. I purposefully stayed quiet for about 10 seconds and then I looked him straight in the eye and said "I like them, but just not for $15...can you give them to me for $5?" He immediately responded, "no ma'am, I can't. I could do $10." I smiled at him and said, "you're so kind! Thank you. Actually, you know what, let me see how much cash I have!" Up to this moment, I knew I wanted to spend $8 on them and that I had a five dollar bill and three ones in my pocket. I reached into my pocket, drew out the cash I had, and then I said "well, I have $8 cash. Deal?" And he replied, "deal," and walked away as he slid the cash into his pocket. Cash. Cash is your thrfit shopping friend to have and hold dearly. Sometimes it'll save you a couple bucks, and sometimes it will save you hundreds! Driving the 2017 Mazda CX-5 and going thrift shopping was a match made in heaven this week! 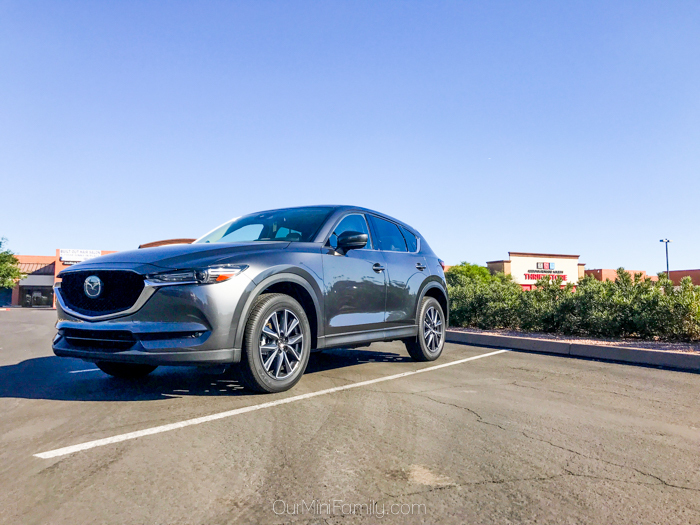 I had the chance to test drive the CX-5 and it was my first time with it--I enjoyed it a lot! I would equate the Mazda CX-5 to Toyota's RAV4. It handled really well on the road and had just about every safety and technology feature I would expect from a 2017 SUV-style vehicle. 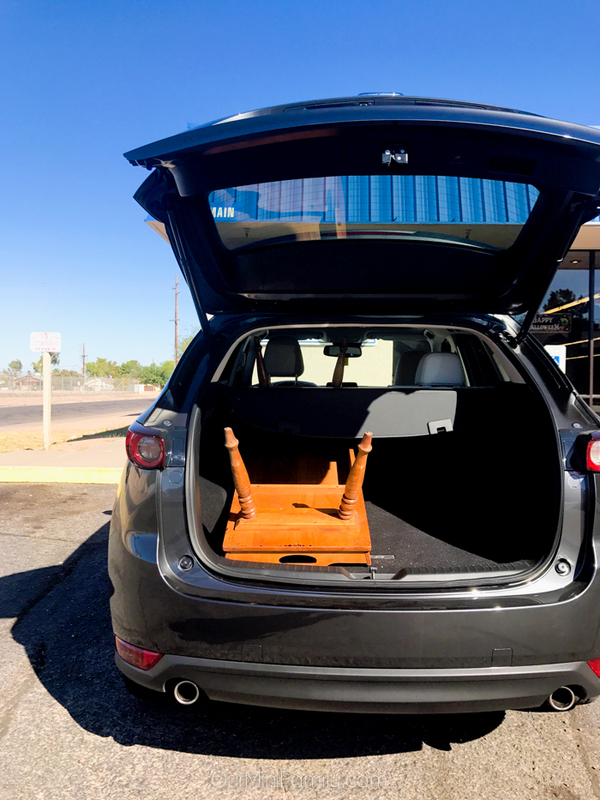 I was able to pull the backseat chairs down in seconds and make plenty of room for all of the furniture I was able to find while I was thrift shopping around the valley! What was even more helpful was the MAZDA CONNECT™ information system and the backup camera, since the statement chair that I brought home was so large I could not see out of my rearview mirror I was able to safely and confidently navigate out of parking lots and back up with confidence. Thanks to Mazda for allowing us to test drive the 2017 Mazda CX-5 while we went thrifting! I LOVE thrift store shopping! You can find some awesome clothes for a unique look. 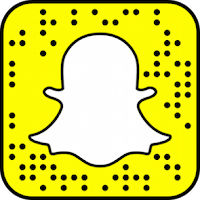 You can find all kinds of super cool furniture. You can find EVERYTHING. It looks like you scored big! Thrift store shopping is so much fun. Every trip is another adventure. Wow. A lot of space in the back of that Mazda. We love thrift store shopping as a family. Thrift store shopping is one of my favorite types of shopping. I can say so much money and still make my house look beautiful. Okay, I would love a table like that. Thrift shopping is one of my absolute favorite things to do! I have been thrifting every week for a lifetime and I have never thought to negotiate prices!! I am going to do this next time I see something that is really overpriced. I love grift shopping. I always score some great deals while thrift shopping. I love St Vincent De Paul stores. We have one here too that has some fun thrift finds. You know we don't have any good thrift stores here. I wish we did! I always make sure my trunk is empty when I go Thrift shopping. It is my favorite thing to do on a Saturday.I always find a great deal. We hit ours at least once a week. Can't miss out on all the new things people bring in! Bringing along pictures of your furniture or wall color is such a good idea. I'd like to be able to hit 2-3 stores on thrift store run too. Extra car storage space would make that easier. I love that table! I need to go thrift shopping more, but it would help to have someone like you come along, lol. Haggling is not my forte. Wow what a nice find. I have friends that love to thrift shop. I have to try it. I really love that table, wow! I love thrifting, I started around 18 years old and still love it. Like the idea of thrift shopping but I don't see many in our neighborhood. Have to look better and see if I can find one. You can get great deals in a thrift store.